Following Utah pesticide regulations is essential to maintain compliance within your pesticide storage area. It helps you avoid hefty fines while bringing safety to your environment. We’ve outlined below a few things to remember when storing your pesticides in the state of Utah. Utah pesticide regulations are in place for the protection of your community and environment. Heeding all pesticide storage laws helps prevent harmful pesticides from entering groundwater and streams, where it could harm local wildlife, not to mention your neighbors who drink the water. It can also mitigate explosion hazards on your property. Understanding Utah pesticide regulations can help you avoid these dangerous situations. Electrical: Your electrical systems should be nonflammable, encased with non-corrosive materials, and preferably vapor-proof. This reduces the risk of a fire. Ventilation: Mechanical ventilation may be necessary to prevent the buildup of harmful vapors. Personal Safety: Your pesticide storage facility should be equipped with personal safety equipment such as eyewash and shower stations. Explosion-Proof: Explosion Proof accessories can lower the hazards associated with explosion hazards. Fire Hazard: Proper signage can alert personnel and visitors of the dangers of fire. Smoking should be prohibited and all sources of ignition should be kept away from your storage facility. Your pesticide storage facility should be equipped with secondary containment. This prevents harmful materials from escaping your storage facility and entering the environment, where it could contaminate the groundwater and harm local wildlife. It is important never to drain your pesticides or rinse-water into the ground, for the safety of everyone. The general guideline is that your containment area should be able to hold at least 100% (if not 110%) of the volume of your largest pesticide container. Inventory: Keeping inventory can help you know at any given time what pesticides you have on hand, and what amount. It can also help Emergency Response teams understand what hazards are present at your facility. Storage Amount: Only storing the amount needed for the season can help you minimize pesticide storage hazards. Remember to use the oldest pesticides first, as long as they are within their shelf-life. Good Housekeeping: Maintaining your storage facility with proper housekeeping techniques can minimize hazards, enabling personnel to quickly identify leaks or spills, and allowing you to clearly see container labels. Original Containers: Only store your pesticides in their original containers. The container label should be legible in order for you to legally use the product. Segregation: Segregate your pesticide storage from all other materials, agricultural or not. Separate it from feed, seed, and food. Fungicides and insecticides should be stored separately. Restricted Access: Locking your pesticide storage facility can restrict access only to qualified personnel. Remember to follow all Utah pesticide regulations for higher safety. Note: While this document may cover a number of important compliant pesticide storage solutions, it cannot address every single situation for keeping pesticide storage maintained and compliant. 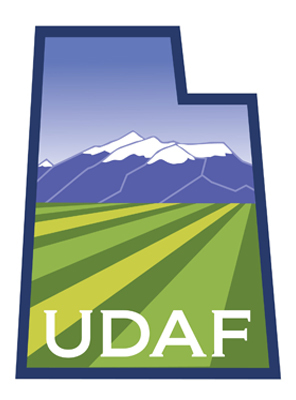 Refer to Utah pesticide regulations and federal documents for total coverage of regulations.